They were constructed, we have been told, in moments of enthusiasm by the irresistible impulse of popular faith. There is something which may give us the idea of those collective movements: the pilgrimage to Lourdes. There faith is intense, expansive, generous. Nonetheless, I am not aware of a single work of art, or even a beautiful canticle which has resulted from that magnificent outpouring of prayer. How can we know if the purest Gregorian chants would have the power these days to transport the crowd and excite the piety of the faithful? It is for that same reason that the patriotic songs which quicken French hearts with the most powerful and vivid collective sentiments do not necessarily amount to being poetry or music. I understand you, you will say. You want to bring into existence a craft tradition strong enough to orient all individual efforts toward religious expression, that tradition being the hieratical. Let us see. Hieratism is an art of of formulas, symmetry, synthesis and abstraction. It beautiful to imagine synthesising, in a few simple, architectural forms, in a system of hieroglyphics, the majesty of dogma. That is a dream which Oriental barbarians conceived when they came into contact with Greek culture and Latin decadence; it is a dream taken up by the 19th century. All those attempting to realise it, from the Nazarene School of Düsseldorf to the young Rosace School, claimed inspiration not from the Byzantines, but from the Primitives, proof that they understood them not. Those who have visited Monte Casino know what a magnificent effort was made in the same sense by the Benedictine monks of the Abbey of Beuron. But those same Beuron monks insist that they are not disciples of the western Middle Ages. They have another ideal, that of ancient Egypt and the archaic Greeks, of which, they say, the Byzantines gave only a very inadequate image. 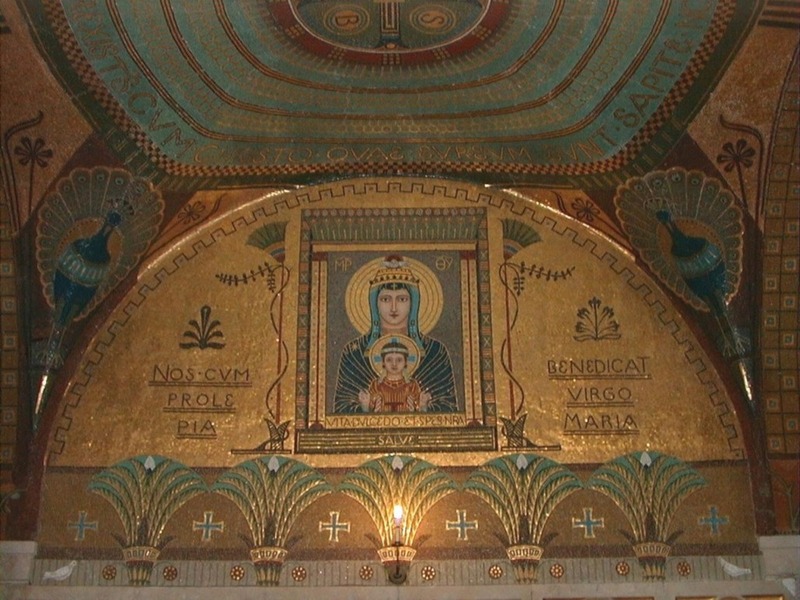 Example of Beuron art in Monte Cassino, late nineteenth century, badly damaged in Second World War, recently restored. Now then, what characterises Medieval Art, is its development away from hieratism through love of life. This is the eternal opposition of East and West. So true is this that when Syrians depicted the Magi come to adore the God-Child, symbolically in the number of three, the West felt the need to name them Gaspard, Melchior and Balthazar, preferring to make of them the concrete but apocryphal subject of a legend rather than to accept a synthesis which they did not understand. When those same Syrians diffused the image of the saintly bishop Nicholas throughout Christendom, and to stress his hierarchical and moral superiority, they depicted him as larger than his flock, the Medieval West invented the legend of the pickled boys. (6) Let us understand well why it was that Cimabue's Madonna was carried in triumph through the streets of Florence, accompanied by the sound of trumpets and popular rejoicing: Cimabue was breaking with the Greek manner, the maniera goffa, (7) with its formula. Nothing is more alien to the Middle Ages than abstraction. In the language of that age, all the words are borrowed from nature, the "Parlar visibile" of Dante. It is allegory. Books such as the Shepherd of Hermas, the Mirrors of Vincent of Beauvais, or Dante's Comedy impressed on the Middle Ages the precise predicates of Christian symbolism. It is preserved tightly in the liturgy. All the interpretations of the doctors and commentaries of the Scriptures have to take it into account, but the most subtle dogmatic truths are represented by means of objects copied from nature. (6) The story tells how St Nicholas sitting down to dine in an inn realises that the meat is in fact the flesh of three boys, murdered and pickled by the butcher. He stops the meal and resurrects the boys. The story features in Benjamin Britten's cantata St Nicholas. I do not know if Denis's account of its origin is accurate but it does not appear in the standard Orthodox Great Collection of the Lives of the Saints by St Demetrius of Rostov. (7) Reference to a phrase - ‘that clumsy Greek style’ (quella greca goffa maniera) - in Giorgio Vasari's 1550 Lives of the Most Excellent Painters, Sculptors, and Architects, from Cimabue to Our Times. It seems more likely. though, that Cimabue was being celebrated in his day because at last it seemed Italian art was catching up with the then more naturalistic art of the Greeks. Could we say it is a symbolist art? But then, all art worthy of its name is symbolist, because all art has as its goal to signify something. Hieratism and allegory, each within its genre, are closed languages. But symbolism, by contrast, is the natural language of art. The one expresses ideas, the other, sentiments; one speaks to the mind, the other to the eyes; the one is founded upon conventional language, the other uses those proximate correspondences which we perceive between the states of our souls and our means of expression. It has been the moderns who have revealed the mysterious possibilities of that sort of symbolism. But our modern art is permeated by subjectivity. I fail to find anything of the sort in the treatise of Cennino Cennini, and I have always seen in the works of the thirteenth, fourteenth and fifteenth centuries that nature, to employ Cennini's expression, was the triumphal doorway of Art. Yes, Medieval Art is a realist art. Cennini also says that drawing from nature is the necessary condition of everything else; a painter should never pass a single day without drawing something. Dante boasted of the trompe-l'oeils of the bas-reliefs of the Purgatorio, where the incense smoke is so well imitated that sight and smell are confounded! And Bocaccio admired the realism of Giotto! All of Medieval Art is a fervent search for truth: truth in all its forms, natural truth and supernatural truth mingled by means of the same curiosity, the same longing for knowledge. St. Thomas expresses it very well when he says of art that it is delectable even when it presents things that are unpleasant, monsters, for example (things of which we do not admire the originals). St Thomas says there is a double profit to be had: firstly, ratione cognitionis, as it is advantageous to be informed; then ratione operationis, as the act of reason which must be accomplished if we are to gain this instruction, is agreeable in and of itself. Hence in their beginnings Science, in its means and expressions, was indistinguishable from Art. Renan rightly says: "Most ancient categories of Science, excluded by the moderns, corresponded to those external aspects of nature which are no longer taken into account but which contained their share of truth."